In today’s ever changing world of fashion and technology, very little remains constant. The latter does not necessarily hold true when it comes it Swiss-made watches, most notably Frederique Constant Swiss-made timepieces. Although the styles, sizes and shapes of Swiss-made wristwatches do change from year to year, the time-honored excellence and precision craftsmanship have remained the same for generations in time. This especially is consistent with prestigious Swiss watchmaker Frederique Constant. The brand was founded in Geneva, Switzerland during 1988 by Dutch entrepreneurs Peter Stas and Aletta Bax, who sought out to create hand-assembled and affordable timepieces of the highest quality, which would be controlled and checked at their Geneva facilities. Little has changed at Frederique Constant in regards to their precision, bespoke timepieces since the brand was founded 28 years ago. Frederique Constant’s core values remain the same and the brand is one of the very few family owned Swiss watchmakers in the world today. Several aspects have changed: Frederique Constant is now one of the largest Swiss watch manufacturers of men’s and women’s watches with a larger watch plant in Plan-Les-Ouates, Switzerland and global distribution to over 100 countries. Frederique Constant is most noted for its first timepiece caliber, the award-winning Heart Beat, which was introduced in 2001 and is still in production today. The World Timer, another innovative timepiece from Frederique Constant, automatically synchronizes the time for 24 international cities by placing the desired location at the 12 o’clock hour on the dial. 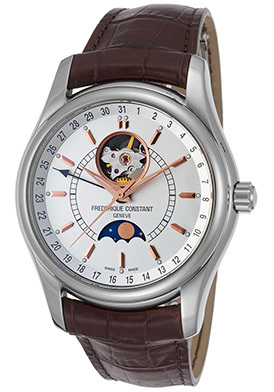 You’ll find an impressive array of Frederique Constant watches at TheWatchery.com, including models from the Maxime, Double Heartbeat, Art Deco, Clear Vision, Vintage Rally and Delight collections. Triumphant in precision and design, the Frederique Constant Moontimer Automatic men’s watch features the meticulous craftsmanship and design the brand is renowned for. The round, contoured case in premium grade stainless steel is polished to a lustrous glow and is presented on a handsome, crocodile-textured brown leather strap with a convenient deployment clasp closure. The stationary bezel encircles the bright white dial with an open-heart and moon phase window, rose gold-tone sword hands and a black arrow date hand that works with conjunction with the date calendar on the outer dial. An exhibition skeleton case back lets you see the intricate automatic movement inside. Features include a scratch resistant sapphire crystal above the dial, a 38-hour power reserve and water-resistance to 100 meters or 330 feet. 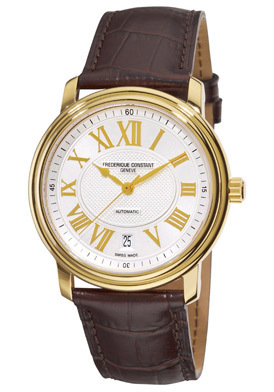 Frederique Constant Moontimer Automatic men’s watch is 43mm in diameter and 11mm thick. The Frederique Constant Double Heartbeat Diamond Automatic women’s watch sparkles with glamour and brilliance. This updated model of the 2001 classic, features a double open heart shaped window on the white dial with eight shimmering, premium-cut diamond hour markers and rose gold-tone pie-cutter hands. The perfectly round case in lustrous 18K rose gold-plate is presented on a white satin facing leather strap. An exhibition skeleton case back reveals the Swiss-made automatic movement inside. Features include a scratch resistant sapphire crystal above the dial and water-resistance to 60 meters. Frederique Constant Double Heartbeat Diamond Automatic women’s watch is 35mm in diameter and 10mm thick. The Frederique Constant Limited-Edition Vintage Rally Chronograph is another exemplary time-keeping choice. This highly distinguished men’s automatic timepiece features the highly polished case in premium-grade stainless steel on a handsome black crocodile-textured leather strap with contrasting white stitched detail. The stationary bezel surrounds the silver-colored metallic dial with a black outer dial, three black background sub-dials, luminous sword hands and luminous hour markers. The dial features small-second, 30-minute and 12-hour countdown timers. Features include an exhibition skeleton case back, a scratch resistant sapphire crystal, along with a screw-down crown and case back for water-resistance to 100 meters or 330 feet. 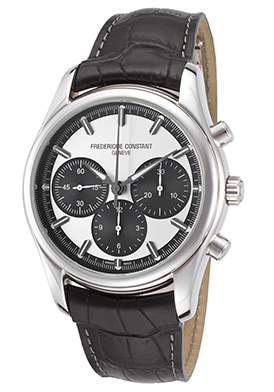 Frederique Constant Limited-Edition Vintage Rally men’s chronograph is 43mm in diameter and 15mm thick. Breathtaking and alluring, the Frederique Constant Art Deco Diamond Women’s watch is pure enchantment. 102 dazzling round-cut diamonds are pave-set to glowing perfection on the lustrous bezel and lugs of the Tonneau shaped case in polished premium grade-stainless steel. A cabochon-cut blue stone dramatically tops the fluted stainless steel crown. The sumptuous black satin facing leather strap adds to the luxurious design. The multi-layered silver colored dial shines a small-seconds sub-dial above the 6 o’clock hour, black pie-cutter hands and Roman numeral hour markers. Features include a scratch resistant sapphire crystal above the dial, premium Swiss-made quartz movement inside and water-resistance to 30 meters or 100 feet. 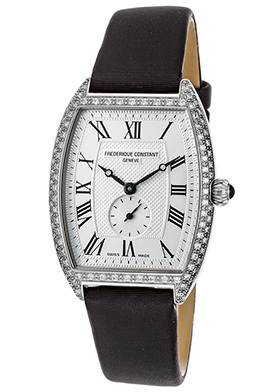 Frederique Constant Art Deco Diamond Women’s watch is 30mm wide and 6mm thick. 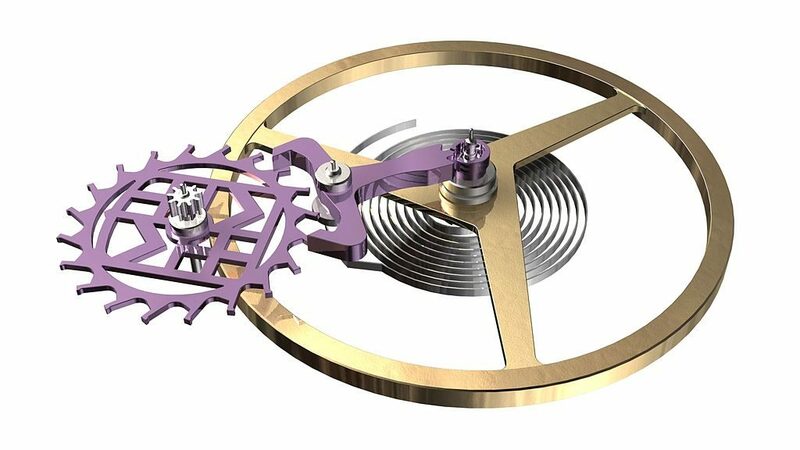 Frederique Constant Heartbeat escapement wheel image courtesy of Wiki Commons. Today after 26 years in operation, Frederique Contstant is one of the largest Swiss watch manufacturers in the world and their precision timepieces for men and women are sold in over 100 countries. Frederique Constant’s affordable luxury is one of the keys to their success. Another is that each and every aspect of the watches they manufacturer …from their initial design to final assembly is produced at their watch plant in Plan-Les-Ouates, Switzerland. What’s more, all of the brand’s precision automatic and mechanical movements are created at their Swiss watch facility. In 2001, Frederique Constant introduced its first timepiece caliber, the Heart Beat, which went on to win awards for its precision and time-keeping accuracy. Frederique Constant is also renowned for its innovative watch designs, including the World Timer wristwatch, which automatically synchronizes the time for 24 international cities by placing the desired location at the 12 o’clock hour on the dial. You’ll find many prestigious Frederique Constant wristwatches for men and women at luxury retailer The Watchery, during their Frederique Constant: Timed To Perfection event. 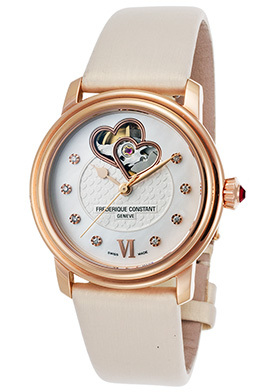 The Frederique Constant Persuasion Heart Beat men’s timepiece is a standout. This outstanding automatic watch features the award-wining Heart Beat movement the brand is famous for. The classic traditional styling gets noticed with a perfectly round case in polished yellow gold plate and an alligator textured leather strap. The highly polished bezel encircles the intricate silver colored dial with a guilloche center, gold tone hands and Roman numeral hour markers. A window at the 6 o’clock hour reveals the automatic date calendar. An exhibition case back reveals the intricate movement inside. Automatic timepiece is 40mm in diameter, 10mm thick and is water-resistant to 50 meters.